Flying High! Nader Zadi sunglasses featured in US AIRWAYS Magazine. These are not your father’s sunglasses. 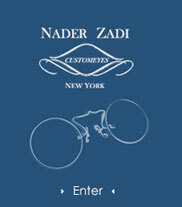 Nader Zadi crafts eyewear that complements facial features and proportions as well as complexion. Working by appointment only from his studio in Manhattan’s Upper East Side, Zadi holds a vast collection of vintage gold frames and nose bridges, which he custom fits according to individual taste.